On this page you will find a variety of older documents that we have removed from active pages but may still be of interest for historical purposes. They are organized very roughly by content and date but not listed in any particular order – let the treasure hunt begin! The USDA Forest Service, Pacific Southwest Region, State and Private Forestry, Forest Health Protection program provides a key role in monitoring Sudden Oak Death and Phytophthora ramorum-caused mortality. Below are additional reports, photos, and maps from monitoring efforts around California. These photos depict Sudden Oak Death areas found in Humboldt County. Click on an image to view the Landscape Photos Library. 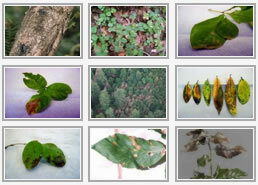 Below are early detection surveys conducted of P. ramorum in high risk-forests of California. The full text of Phytophthora ramorum 7 CFR Part 301, which is the interim rule published on 02.14.02 identifying what materials are regulated and how. Updates to the interim rule published in July and September of 2002. A FAQ page specific to federal regulatory issues. The USDA strategic plan for Phytophthora ramorum, titled: “Plant Diseases Caused by Phytophthora ramorum: A National Strategic Plan for USDA. California imposed regulations for Phytophthora ramorum in May 2001. The regulations are continually updated to add new hosts and to reflect new scientific understanding. Within CDFA, the regulation controlling plant movement was prepared by the Pest Exclusion Branch, Plant Health and Pest Prevention Services Division, California Department of Food and Agriculture (CDFA). It is listed in the Plant Quarantine Manual as: State Miscellaneous Ruling 3700 – Oak Mortality Disease Control. The regulation establishes restrictions against P. ramorum and host plants. State Miscellaneous Ruling 3700 includes, among other things, a description of the pest (P. ramorum), delineation of the regulated area, specific articles and commodities covered, and the restrictions. Appendices include updates to the host list and to the infested areas, sampling guidelines for taking field samples of the pathogen, and the Summary Agency Contact Responsibility. This last item lists in detail which state or federal agency has jurisdiction over which type of land, and under what circumstances. For the entire text of the initial ruling, click on the following link:http://pi.cdfa.ca.gov/pqm/manual/pdf/455.pdf. Subsequent emergency amendments have added species to the regulated and associated hosts list, and most recently expanded the regulated area to include Lake County. The synopsis of this amendment follows. The identification, containment and/or eradication of P. ramorum in plants and plant production in the United Kingdom is the responsibility of various divisions within the Department for Environment Food and Rural Affairs (DEFRA). These include the Plant Health Division (policy and legislative responsibility), the Plant Health and Seeds Inspectorate (enforcement of inspection, surveys, eradication), and the Central Science Laboratory (scientific and technical support). The Forestry Commission is responsible for the control and eradication of the pathogen in forest trees and wood. Their work includes research, diagnosis, survey, and scientific consultant. For details on their program, see their website at Forestry Commission. The Canadian Food Inspection Agency has implemented strict import regulatory controls to prevent the entry of Phytophthora ramorum and Sudden Oak Death disease to Canada on infested goods. The most recent regulatory changes, updates, advisories, and information regarding confirmed and associated host species are below.